ASD-associated SCN2A variants impair NaV1.2 channel function. 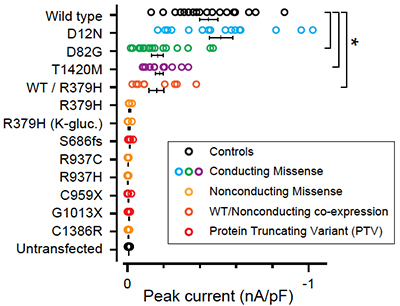 Electrophysiological recordings of HEK293 cells expressing wild-type or mutated channels revealed reduced current amplitudes or a complete loss of NaV1.2 channel conductance for the majority of the ASD variants. Peak current amplitudes from D12N-mutated channels were comparable in size to wild type; however, additional experiments revealed alterations in the inactivation kinetics of the channel (not shown). Image from Ben-Shalom R. et al. (2017). Mutations in the gene SCN2A, which encodes the neuronal sodium channel NaV1.2, have been linked to both infantile seizures and autism spectrum disorder (ASD). Previous studies indicated that SCN2A variants associated with infantile seizures led to a gain-of-function in NaV1.2 channel activity and increased neuronal excitability; however, how variants associated with ASD affect channel function remains unclear. In the current study, SFARI Investigators Kevin Bender and Stephan Sanders performed functional analyses of 12 de novo SCN2A mutations identified in ASD cases from the Simons Simplex Collection and the Autism Sequencing Consortium. They found that all ASD-associated variants reduced or eliminated channel function in heterologous expression systems. Results from these studies were then incorporated into a computational model of cortical pyramidal neurons. Such a model predicted that all of the ASD variants would impair neuronal excitability at early developmental stages. Thus, the variants associated with ASD have an opposite effect to those associated with infantile seizures. Further investigations into the neurobiological consequences of SCN2A variants, combined with behavioral and neurocognitive studies such as those under investigation as part of the Simons Variation in Individuals Project (Simons VIP), will help to advance our understanding of genotype-phenotype correlations for this gene. Ben-Shalom R., Keeshen C.M., Berrios K.N., An J.Y., Sanders S., Bender K.